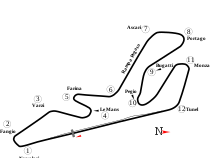 The 1968 Spanish Grand Prix was a Formula One motor race held at Jarama Circuit on 12 May 1968. It was race 2 of 12 in both the 1968 World Championship of Drivers and the 1968 International Cup for Formula One Manufacturers. It was the first race after the death of former double World Champion Jim Clark, who had died in a non-championship Formula Two event in Hockenheim, Germany the previous month. Clark had led the drivers' championship before this race, on 9 points, after he won in the first race in South Africa. Following Jim Clark's death in Germany, and the death of his replacement Mike Spence during practice for the Indianapolis 500 just five days before the race, team principal Colin Chapman opted not to come to Spain for the first championship Spanish Grand Prix since 1954, still being devastated by the losses. Graham Hill was the only works Lotus driver; a second car was entered for Jackie Oliver but could not be set up in time. The race saw the first appearance of Team Lotus in the colors of sponsor Gold Leaf instead of the traditional British racing green, making them the first works team to paint their cars in the livery of their sponsors. Jackie Stewart was absent due to a wrist injury he sustained while driving in a Formula Two race, so it was up to Jean-Pierre Beltoise to debut the new Matra MS10. During qualifying, Ferrari's Chris Amon took his first ever pole position with Graham Hill for the mourning Team Lotus down in sixth place. Lotus fate turned however during the race on Sunday, contested in searing heat. Pedro Rodríguez took the lead at the start in his BRM, followed by Beltoise, Amon and Hulme. The Frenchman moved into the lead on lap 12, only to drop back four laps later with engine troubles. Amon was now back in the lead, followed closely by Rodriguez until the Mexican spun and crashed on lap 28. While he waited for his mechanics to pick up the car, spectators "descended on the car like vultures and stripped off the mirrors, seat, windscreen and nose cowling". These retirements elevated Hill to second place behind Amon, who suffered a fuel pump failure on lap 58, handing Hill, who had been a mile behind, first place and victory. Hulme was close behind Hill, but when his McLaren lost second gear, he needed to back off and the Englishman cruised home. Beltoise recovered from his mechanical troubles and recorded the fastest lap of the race. ^ a b c d e f "Hill victorious for mourning Lotus". ESPNf1.com. ESPN. Retrieved 3 February 2015. ^ a b "Grand Prix Results: Spanish GP, 1968". Grandprix.com. Retrieved 3 February 2015. ^ "1968 Spanish Grand Prix - Race Result". formula1.com. Formula One World Championship Limited. Retrieved 13 October 2017. ^ a b "Spain 1968 - Championship • STATS F1". www.statsf1.com. Retrieved 20 March 2019. ^ "1968 Spanish Grand Prix". ChicaneF1. Retrieved 26 September 2015.